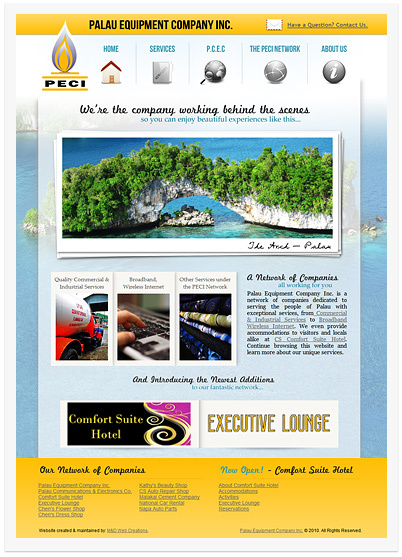 Palau Telecoms - About Us Welcome to Palau Telecoms! Palau Telecoms was pioneered by Palau Communications & Electronics Company (PCEC), which has been operating since 1987 under Palau Eqiupment Company Inc. It began with providing communications through UHF, VHF, and SSB Radios. Palau Telecoms was added to the company to bring broadband, wireless internet to the island and give businesses and consumers a choice when it comes to internet services. Since its establishment, Palau Telecoms has expanded its services to be able to reach as many people as possible, including Babeldaob. We are happy to be providing internet services for hotels, internet cafes, hospital dispensaries throughout Palau, and many businesses as well. Palau Telecoms offers the most affordable internet services on the island with a variety of speeds (kbps) to suit your needs. Please contact us if you have any questions or would like to sign up for our brand of High Speed Internet. Please take time to also visit the Palau Equipment Company Inc. website and see what kind of services it has to offer you.